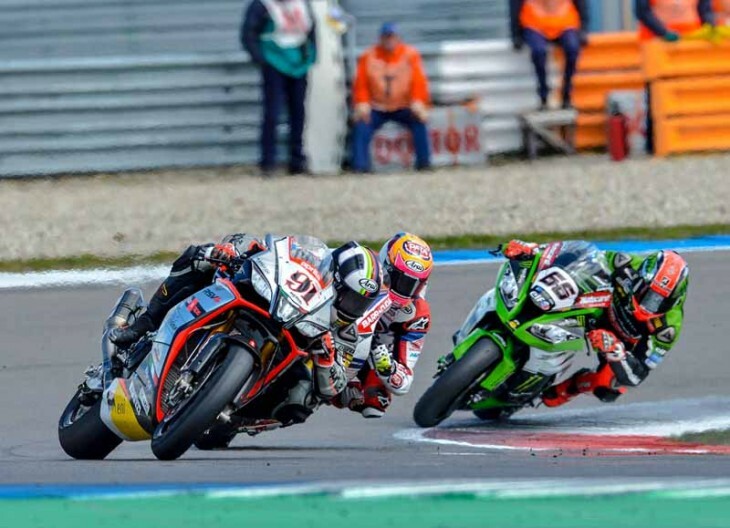 Assen (Holland), 19 April 2015 – The finishing order for the two Superbike races at Assen were identical, putting on a lively show for all the fans that came out to the Dutch track. For Aprilia Racing Team – Red Devils it was an exciting Sunday with Leon Haslam in the leading pack and Jordi Torres riding two great comeback races after starting from the third row of the grid. Haslam battled no-hold-barred in the pack that decided the podium, managing several times to close the gap behind the leaders and entertaining the fans with a series of spectacular scuffles. Especially in Race 2, where the English rider’s pace at about 10 laps from the end seemed to promise an attack for a podium finish. Only front tyre wear, particularly stressed both by the characteristics of the circuit and his riding style, kept Leon from finishing on the podium, making him settle for two fourth place finishes. This confirms Haslam’s hold on second place in the overall Rider standings, the same position that Aprilia holds in the Manufacturer rankings. The pace that Jordi Torres demonstrated in the centre part of the two races was encouraging. The end result, a double sixth place finish, was due almost entirely to the initial laps where the Spanish rookie is still unable to be incisive and take full advantage of the new tyres. In these first apprenticeship rounds Jordi has improved consistently. Now his feeling with the RSV4 RF is solid, so the only thing lacking is the experience he needs to battle at the top of a new and demanding category like World Superbike. APRILIA RSV4 WINS IN THE SUPERSTOCK 1000 FIM CUP. It was a race to remember for Lorenzo Savadori in the Superstock 1000 FIM Cup. Starting from the pole position he earned yesterday, the 2014 season runner-up led the race from the opening laps. After a red flag and consequent restart, Savadori kept his pace and rode the Team Nuova M2 Racing RSV4 RF to victory, also putting the race fast lap on the sheets and moving into first place in the overall rider standings. Taking a win as early as the second race of the season is an exciting result for the team and for Aprilia who is making its début with the RSV4 RF in this category, the one closest to factory bikes. Kevin Calia rode a great comeback race, starting from the fifteenth spot on the grid. With an impressive pace and a series of spectacular passes, Calia finished fifth, just barely missing fourth place. This is further confirmation of just how competitive the new RSV4 RF is.